Introduction to Radio – Weekend radio courses held in Southend-on-Sea. Each priced £68 for all three weeks. Scroll down for more details. Lambeth College Radio Courses – Runs three radio courses. Radio for Beginners (10-week evening class starting in September, January and April each year) provides an introduction to the radio industry and to producing a short programme. The NCFE Extended Diploma and Edexcel National Award (both one year, full-time) both provide more in-depth knowledge and practical skills in radio production. Some of the practical work is linked to Vox Radio, the Lambeth College student radio station. Point Blank London – Radio Production Course – The course features practical training in production, presentation and digital editing plus expert advice on how to find work in the industry. Guest lectures are delivered by presenters from BBC Radio One, Capital Radio, Kiss FM and Choice FM. Students have the opportunity to broadcast live via the Point Blank Internet radio station. Radio Surgery – Presenter training in Lancashire, including one-to-one sessions and demo tape production. This course, held at South Essex College in Southend-on-Sea, is now in it’s eighth successful year. It runs on selected Saturdays throughout the year and is a three week course costing £68 in total. ‘Introduction to Radio‘, runs for three weeks on a Saturday mornings (9am to 12pm) and provides an overview of the radio industry, details of how a radio station works, and insider information on UK broadcasting. 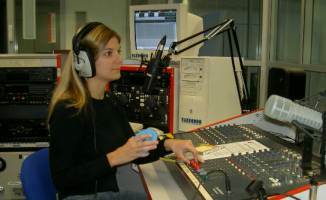 The college has its own radio studio, where students get hands-on experience working the equipment, as well as understanding how to prepare and present a radio show. Students can progress to ‘Radio Broadcasting Level 2’, which delves into show preparation, interviewing, digital editing, production, commercials and scriptwriting. More details: “Introduction to Radio Course Information“. Aspire run courses and training for TV presenters at 3 Mills Studios in London. The National Film and Television School in Beaconsfield, Buckinghamshire run an “MA in Producing and Directing Entertainment Television Entertainment”, starting in January each year. Pukka Presenting – TV presenter training from industry professional Kathryn Wolfe. Retail Therapy TV – Presenter and media training, run monthly at a TV studio close to Heathrow Airport. Screenhouse Training – One day courses in Leeds on Single Camera Directing, Production Co-ordination, Factual TV Research and How to Get Ideas Commissioned. TV Training Academy – Based in Henley-on-Thames, they offer one-to-one tuition, plus 1 and 2 day courses in London and on location. Telly Faces – Want to get your face on the box? This company can help prepare a demo tape and get you started. London Academy of Media, Film and TV (London) – Evening and week-long courses providing practical training for all aspects of broadcasting, television and production. Based in Lancing St, London NW1. Call 0870 62 65 100. Midi School – DJ , Music Technology and Sound Engineering courses in Manchester. The Music Mill – Devon-based facility that provides courses in radio presentation and recording studio operation. SSR – Courses in Audio Engineering, as well as TV, Film and Audio Post Production, in Manchester. University College Falmouth offers both TV Production and FdA Radio Production courses. FrequencyCast UK Media Podcast – A lesson in how NOT to podcast? I am based in Birmingham and I wish to train in tv and radio presenting part time.I am mainly interested in being a radio music presenter (dj).Please let me know where I can register to be trained on weekends in Birmingham (uk). Bismark Okrah is my name from Ghana, am very glad about your institution. But am having certificate in broadcasting journalism in music presentations and talk show as DJ in sena radio but are want to further my course, so please how can i apply the visa to UK. hoping to hear from soon, Thank You. Dear Sir/Madam. I have always had a keen interest in Broadcasting and I would like to enquire about Radio and Broadcast Production Training. Could you please send me information. Thank you. Yours Sincerely, John P Dyer. I am very interested in doing the course. I would like to know more about the course and also job offers due to the completion of the course. Hello, I would please like to know the process of undergoing a short course on radio/ tv broadcasting as an international student. Also, in any potential job opportunities which may arise upon completion.